We welcome the opportunity to inspect your system and determine just how much you could benefit from an air conditioning replacement. Are your utility bills during the summer months in Winter Haven, FL driving you crazy? Does your home feel humid and uncomfortable, regardless of the thermostat setting? Is your air conditioning system more than 10 to 15 years old? If you said yes to any or all of these questions, then it might just be time to consider air conditioning replacement. 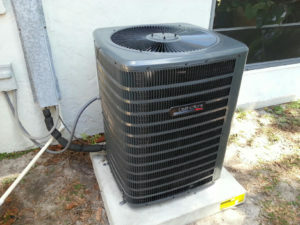 Long before your air conditioner stops working or needs major repairs, it decreases in efficiency. That means increased humidity in your home and higher-than-normal utility bills as it struggles to operate. Besides that, an older system was not built to the same efficiency ratings that a new air conditioning replacement will be. Regulations challenge manufacturers to make more efficient units now than ever before; thus, today’s units will save you hundreds of dollars in utility costs over their life span. At Winter Haven Air Conditioning™, we welcome the opportunity to inspect your system and determine just how much you could benefit from an air conditioning replacement. In most cases, the utility savings alone warrant the cost of doing so, even if your system is still chugging along. You could be throwing away dollars that could be going toward paying for your new system. Another thing to consider is that an older, inefficient system may not be protecting your home from a dangerous health hazard – toxic mold. You may not see it, but if your home’s humidity levels are not kept in check, it could be growing silently in your home’s walls, attic, and/or crawlspace. If your family is experiencing any respiratory distress, it is particularly vital that you have your home checked. Give us a call today to arrange for a consultation, and don’t forget to ask us about our Preventive Maintenance Contracts for annual maintenance to keep your air conditioning replacement operating efficiently all year long.